Thursday May 17th 1923 I did some washing in AM and cleaned up my part of the house. We went to Fannies to a luncheon at one oclock. Very pleasant. A fine bright day. I came home about four oclock. In the evening Hattie and I went to a play "The Copperhead" by S U I students. Friday May 18th 1923 All the things here brought up from Fannies in the forenoon to entertain here at 5 oclock. There were about 50 ladies here. After they were gone the girls re-arranged tables and got some things ready for tomorrow. Saturday May 19th 1923 The girls had the same number of ladies at luncheon today. The weather was good and every thing passed of nicely. A letter from Sue & Sallie today. Sunday May 20th 1923 It was late when we got up. Hattie to S S and church. William & Mary in for things of theirs. I wrote to Laura. After dinner I rode out to Hedges with Otts folks. They were going to Cedar Rapids. Wrote Ida later. Hattie gone to church in evening. 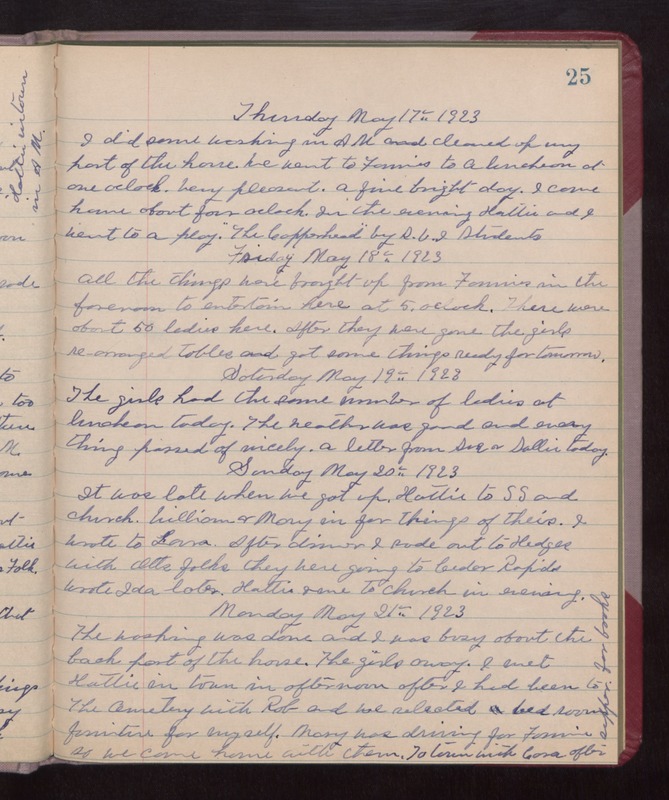 Monday May 21st 1923 The washing was done and I was busy about the back part of the house. The girls away. I met \Hattie in town in afternoon after I had been to The Cemetery with Rob and we selected bed room furniture for myself. Mary was driving for Fannie so we came home with them. To town with Cora after supper for books.